Planning a menu for a party is easy. All you have to do is keep in mind that having a balance of savory and sweet items is important. Keep it simple by planning the menu around items that you already have in the pantry or the freezer like spinach roll-ups. Spinach pinwheels are easy to whip up for a party. 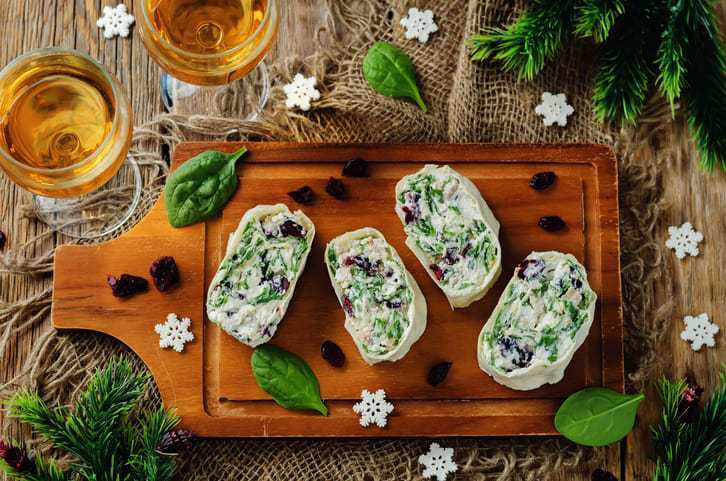 It is as simple as some frozen spinach mixed with cream cheese, hot sauce, garlic powder and salt and pepper to make a filling and spread over the dough to be rolled and cut into pinwheels. Baked to a perfect golden brown with crisp layers; it’s a sure-fire crowd pleaser. These snacks can will quench your children’s after school cravings and tide them over until dinner is on the table. Prepared crescent roll dough is used as a time saver (there are even low-fat varieties) and the filling can be interchanged easily as desired. Prepare the filling by combining the spinach, cream cheese, hot sauce, garlic salt, and salt and pepper until combined with a spatula. Set aside. On a lightly floured clean workspace, open the can of crescent roll dough and unravel without breaking apart the segmented pieces. When the dough is stretched in a square, crimp together the cut pieces until there is one dough sheet. Spread the filling over all the dough, and then begin to roll the dough by lifting one side of it and folding it over evenly until a pinwheel is formed. Be sure to be gentle with the dough, as overworking it will melt it, or begin to break. Cut the pinwheel in half, and then cut each half into six, making 12 pastries. Place the pinwheels on a parchment lined sheet pan 4 x 3, pressing down lightly on each one, to flatten a little bit before baking. Bake until golden brown, approximately 18-25 minutes. Oven times may vary. Allow to cool slightly before enjoying. If there are leftovers, keep them in an air-tight container for approximately 2-3 days.